Enjoy a unique experience at sea with REDRIB, the RIB that can take private or corporate groups places you would only dream of. REDRIB is also a top class photo boat. The driver is a professional photographer and videographer specialised in maritime themes and news on water with years of experience. Leaving from the Market Square, we cruise along the coast line of Helsinki; Allas Sauna & Pools, the carpet washers and cafés in Kaivopuisto, Löyly. Then we go full throttle to Suomenlinna fortress and the submarine enjoying the speed and thrill of a RIB! 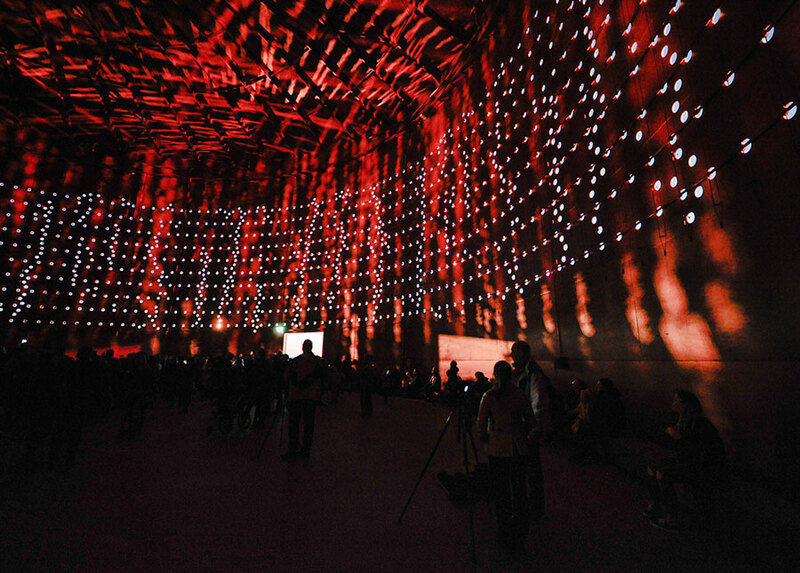 Award winning Light Art Installation Silo 648 is the next stop before we head for the ice breakers on summer holiday. The tour is rounded off with a visit outside the urban pop-up sauna Sompasauna, run by Helsinki activists and open to anybody. But beware, naked human alert! Drop-off Market Square or other pier on request. On this tour city sights are combined with the experience of riding a rigid inflatable speed boat! We meet 20 min. prior to departure at Vironallas, the leisure boat port in front of the old Market Hall on the Market Square, Kauppatori. Here you will be given your passenger equipments for the tour. On this trip we will stay in the boat for the whole trip. After a short safety briefing we leave for a cruise outside the coastline of Helsinki. Already here you see the most beautiful parts of Helsinki from its best side, the sea. The Presidential Palace, the City Town Hall, the Market Square, the Uspenski Cathedral, Allas Sea Pool are all presented at once from the sea side. As we cruise along the speed limit area you get the basic info about the city an its history from your driver and host. We pass the ferries to Sweden, the 1900 century villas of the Valkosaari yacht club and the residential area of Kaivopuisto where many of the embassies are located. We take advantage of the speed limit area and provide you with more info about the sights we pass. The first islands of Harakka, Särkkä, Uunisaari and Liuskasaari are right at our feet. Passing the Kaivopuisto Boulevard with its boat marina, yacht club and sea side cafés, we might see a few carpet washers, a true finnish summer tradition. 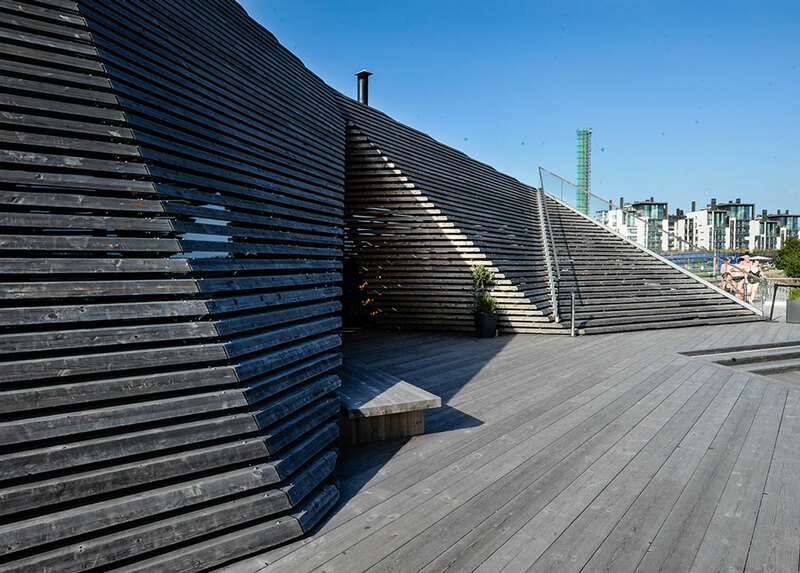 Passing the Carousel café, we cross the small bay and stop outside the new public sauna and restaurant Löyly with its award winning design for a brief info moment. Here you will for shure see sauna bathers in swimming suits jump into the water, side-by-side with the coffee drinkers sitting on the terrace enjoying a summer day. You will also see a bit of the old Hernesaari ship yard, the home of the traditional finnish ice breaker building industry. Here is the end of the talks and the speed limit! 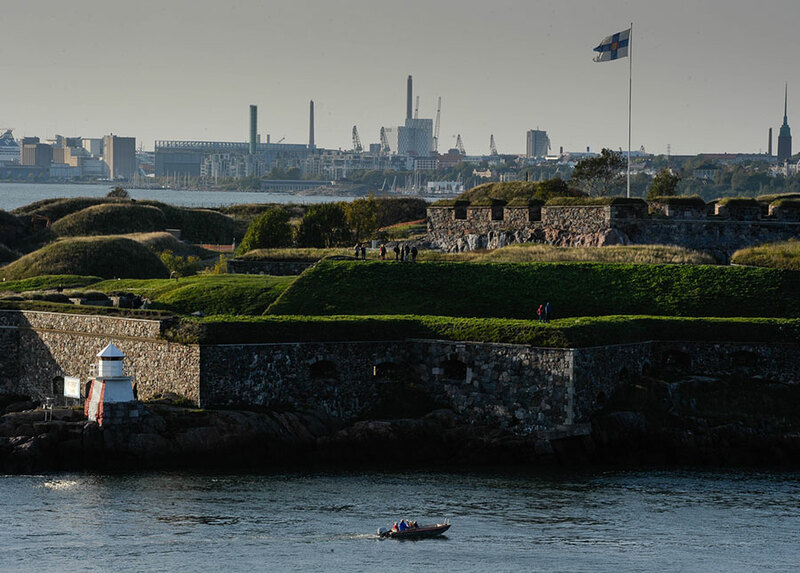 From here we open up full throttle on our speed tour towards the Suomenlinna fortress islands and you get to feel the true nature of a rigid inflatable speed boat! The Helsinki archipelago with its 300 islands opens up just in front of you. On a nice summer day we will make a turn around the recreational island Pihlajasaari too. Passing the passage between Vallisaari and Suomenlinna we drive again slowly. 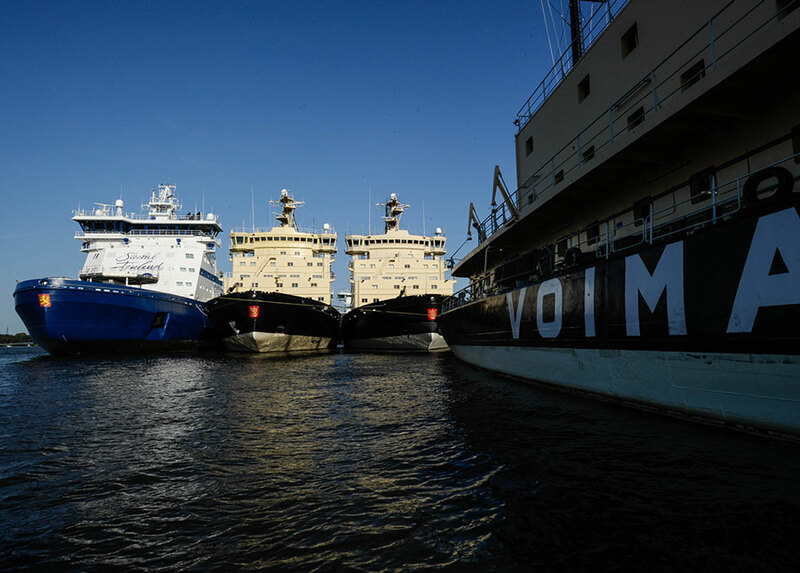 We pass the historical dry dock of the old shipyard, the submarine Vesikko and the Kings Gate while you will get an over all view about the history and daily life of this UNESCO World Heritage Site. From Suomenlinna we pass in moderate speed the islands of Vasikkasaari, Koivusaari and Saunasaari. Now we see summer cottage colonies, a sauna island and the military island of Santahamina, still operating. The award winning light art installation Silo 648, an former oli silo located on one of Helsinki ́s new maritim housing areas, Kruunuvuorenranta is our next short stop. From here we cross the bay of Kruunuvuorenselkä and head for the ice breaker fleet on summer holiday. On our stop right in front of them you get to hear why Finland is a super nation in ice breaking, how the ships work and are being operated. Our last stop is the pop-up sauna Sompasauna, run by city activists. This unofficial non-dresscode sauna is open to anybody for free until the new housing area of Kalasatama will reach the area in the next few years. But beware, naked human alert!On our transfer back to the Market square for drop-off we pass the picturesque old fishermens islands of Katajanokanluoto and Ryssänsaari. This trip is suitable for all ages from 12 years and up and is of easy difficulty level. Outdoor clothing and shoes are recommended. High heel shoes are not recommended. Please note that there is no toilet available on board. We can store a small handbag per passenger on board, but please do not bring any larger bags or suitcases. Guiding language is english and is provided by the driver. We can arrange for a guide in your groups native language upon request. We provide you with all clothing you need for the ride. A whole body floatating suit with spray hood, speed glasses and life wests. Light gloves are available in your suit pockets. In cold weather there is additional boots, gloves and hats provided. You can come as you are, in normal seasonal street wear, we have all clothing you need for the tour on board. This equipment will keep you warm and dry even in a light rain. On really hot summer days, you will wear your own street wear with our life wests and goggles. Small variations in routes may apply due to weather conditions. Driving speed is always according to weather conditions and passenger capabilities: Safety is our highest priority and is never compromised.